3-D printing is a technology that is on everyone’s lips at the moment. From consumer products to human organs, the applications of 3-D printing could change the way we manufacture. However, Skylar Tibbits of MIT is preparing to take this further. In his lab, scientists are working on introducing a fourth dimension to 3-D printing: time. What if 3-D printed objects “could change over time”? This idea has been called self-assembly, or ‘4-D printing’. Before we proceed, it is important to understand what self-assembly actually is. Tibbits defines self-assembly as “a process by which disordered parts build into an ordered structure through simple interactions with each other”. To see an example, click on this link: http://video.mit.edu/watch/4d-printing-mit-self-folding-strand-13803/. Parts can assemble themselves as they contain intelligence. In other words, matter has been programmed. By collaborating with the firm Stratasys, Tibbits uses their “Objet Connex multi-material 3-D printing technology” to program specific properties into the particles being printed. When exposed to water or heat, the particles gain the necessary activation energy to self-assemble into different shapes. Tibbits explains that the 4-D printed components can be placed inside a container. Next, the container can be shaken to provide heat (activation energy) and the components will self-assemble into the pre-designed geometry. The best part about this is: no manual assembly is required! The whole assembly is automated. The applications of this technology might allow 3-D printing to realize its full potential. Once again, this idea is best illustrated through example. For one, smart materials could be used in piping. Suppose that over time, a pipe changes changes its shape from perfectly cylindrical to the third shape shown below. Instead of using power to propel water, the 4-D printed pipe could “undulate to move the water”. This is similar to peristalsis, the “wave of muscle contractions that moves food through our digestive tract”. Next, the pipe could expand into the fourth shape to allow more water to flow. Alternatively, the pipe could close itself completely to stop water flow. Another application that has been suggested is using 4-D printing in certain parts of building construction. The smart material could adapt itself during earthquakes and natural disasters to keep the structure stable and its hosts safe. 4-D printing has potential for the future, but it also faces a few trade offs. Firstly, the printing process is relatively slow compared to other methods. Printing large objects can take days. Secondly, there is a limitation with respect to the materials that can be used. Moreover, the materials currently available are nowhere as strong or effective as those used in modern processes. Thirdly, 4-D printing faces a limitation in size. For example, one cannot print an entire building. Tibbits likes to give the following example to convey this idea: “to 3-D-print a skyscraper, you would first have to build a skyscraper-sized printer”. But this is where the beauty of 4-D printing comes to the fore. Instead of printing a massive object at one go, individual parts can be printed. Next, self-assembly can be used to synthesize the entire object from its individual parts. This idea is simple but its applications are powerful. “People are really excited about it, but I think we have barely scratched the surface,” says Skylar Tibbits. In the future, imagine parts self-assembling into a skyscraper right before your eyes. This Inception-like scenario provides a glimpse into the possible future of 4-D printing. In 1818, Karl Drais invented the Laufmaschine (running machine) which functioned without pedals. His machine is classified as a velocipede, defined as a “bicycle propelled by pushing the feet along the ground”. It is considered as the immediate precursor to the pedaled bicycle. An image of Drais’ invention is shown below. In modern day 2013, a team of German designers sought to redesign the iconic Laufmaschine. The result: Fliz (a name derived from “flitzen“ meaning to “whiz or dash”). Fliz is a concept bike without pedals. Instead, it uses the motion of running to travel faster and further than normal due to its wheels. It certainly is an innovative take of the Laufmaschine but a design analysis reveals that it has its flaws, too. The Fliz’s major feature of difference from the Laufmaschine is design-related. Instead of sitting on the bike, riders are hanging from its frame. The frame itself is made “from a glass and carbon fiber laminate”, making it lightweight. The electric yellow color gives the bike a sleek appearance and makes the bike seem almost like a bee buzzing around. The harness system allows riders to hang from the frame and is designed to serve specific purposes: comfort and convenience. It contains a 5 point belt system that replaces the traditional seat. The rider is tethered to the Fliz using the belt which is designed for comfort. The belt reduces pressure in the groin region, distributes body weight and allows for adjustment of body position. It is also tailor-made for each rider and can be unlocked easily due to the 5 point fastener. The team states that the belt “provides a comfortable, ergonomic ride between running and biking”. The Fliz also contains other functional aspects. The wheels allow users to travel at greater speeds than that of walking or running. When traveling at moderate speeds, riders can place their legs on the treads located on the rear wheel. This allows for relaxation after the legs have propelled the bicycle. The overall design of the Fliz also has certain advantages. Due its streamlined shape, riders can easily navigate through pedestrians in “overcrowded urban space”. Despite its positives, the Fliz has raised a number of doubts about its design. Firstly, people find the design of the bike awkward. The lines between walking, running and cycling seem to be blurred when looking at the Fliz. Secondly, the bike is more of a burden in certain environments. For example, if one was traversing a steep hill, one would rather walk than ride the bike. Only in downward slopes is Fliz an advantageous means of travel. Thirdly, safety concerns have been raised. While riding the bike, riders’ heads are either directly under the frame, or to the left or right of it. If the bike has to halt suddenly, the rider’s head could collide with the frame, causing injury. Also, the odd positioning of the head and the torso (which is forced to lean forward) could result in body pain. Mainly though, a lot of people are asking ‘do we really need the Fliz’? Although it provides greater speed, most people would rather prefer walking or using a conventional bicycle as opposed to this odd-looking vehicle. Moreover, not everyone can ride the Fliz anyway. The bike is only ideal for people whose height is roughly 6 feet. The Fliz concept is a fresh look at the bicycle. There are people who cannot ride conventional bicycles due to physical reasons, and this could be a potential solution for them. 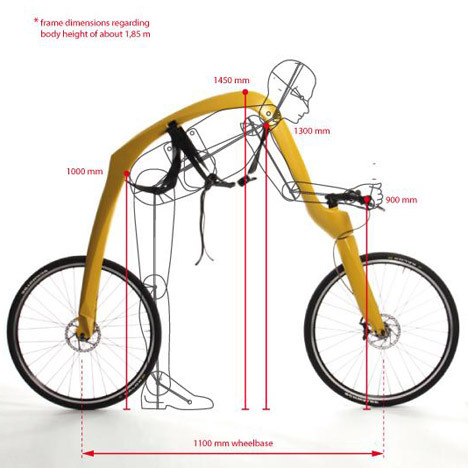 But to replace the conventional bicycle, Fliz most likely faces an insurmountable challenge. You leave your car in the parking lot. When you return, the interior is scorching hot. What do you do? Turn on the AC. Why not harness the sun’s energy instead? 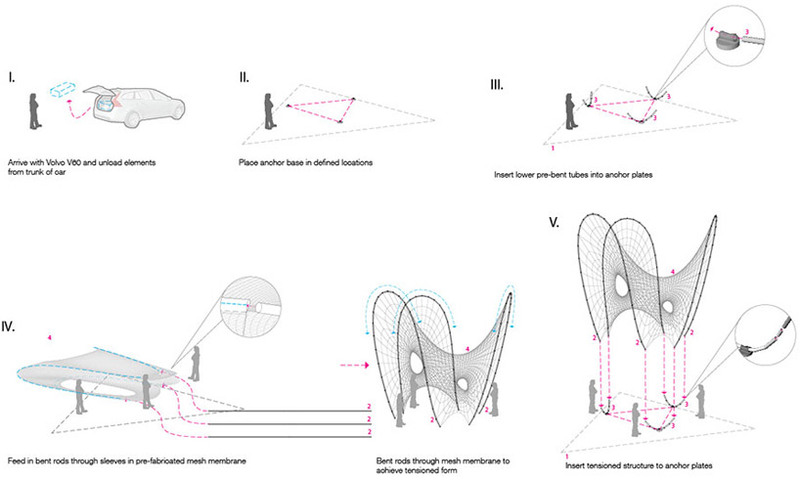 The firm ‘Synthesis Design + Architecture’ (SDA) has used this idea to create an exotic new concept, called Pure Tension. This device is a pavilion that is embedded with photo-voltaic panels. The panels convert solar energy into electricity. The power flows “into a portable battery that charges the car”. An examination of its design features brings to the fore its strengths, as well as its drawbacks. 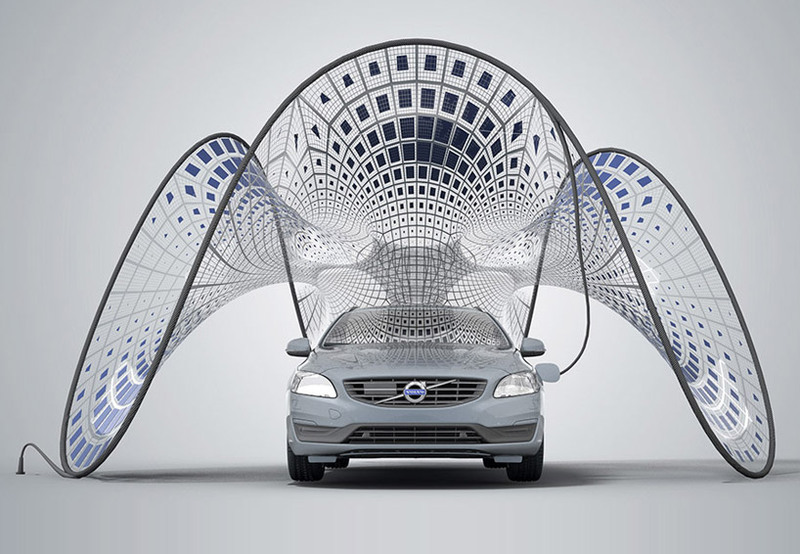 Above is an image of the Pure Tension, showcased with Volvo’s V60 Hybrid Electric Diesel. In terms of design, there are several features of interest. In order to create a lightweight pavilion, engineers at SDA made key choices in material. The surface is made of a vinyl encapsulated polyester mesh membrane. This surface is reinforced by 24 sections of aluminium frame, whose bent profile is achieved by Computer Numerical Control (CNC). It is noteworthy that aluminium is a low-density, durable and sustainable material. The end result is a very lightweight structure, which allows for portability. 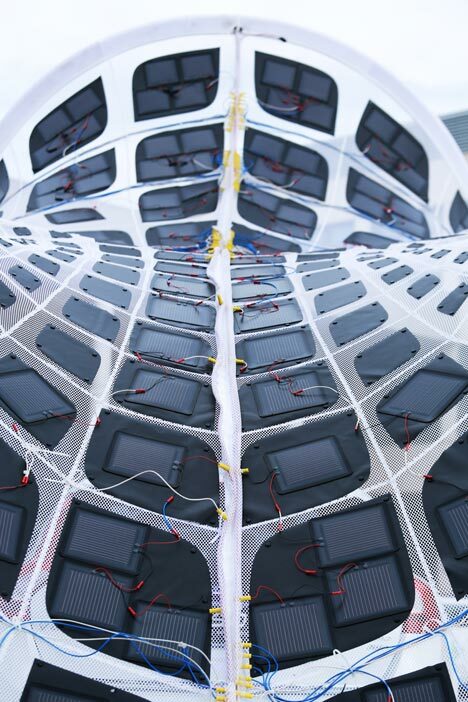 Next, the surface is fitted with “a total of 252 flexible photo-voltaic panels”. The panels are arranged in a specific pattern that maximizes exposure to sunlight. As the sun moves across the sky, the panels which generate the least power are “automatically turned off to ensure maximum power generation”. Wires attached to the surface of the pavilion allow power to flow to the battery. In ideal conditions, “450 watts of power” can be generated and an empty car battery can be charged “in about 12 hours”. The shape of the pavilion is especially striking. Alvin Huang, founder of SDA, had one goal in mind: “to balance utility with beauty”. Engineers at SDA designed the structure’s hyperbolic curves through CAD software. The curves are held in shape by virtue of the carbon fiber ring that borders the structure. The distinct shape gives the Pure Tension an aesthetic appeal, and people would like to have their car covered by this elegant design. This could drive sales should the concept go into production. Another key aspect in design is the fact that the pavilion is collapsible. Due to the flexible structure, one can fold the pavilion completely flat. This facilitates storage as after charging, the folded pavilion can be placed inside the car’s trunk. The Pure Tension concept is not without certain trade offs. Firstly, the pavilion takes up a huge amount of space to set up. In congested cities where houses are packed closely together, not everyone will have the necessary space to deploy the pavilion. Secondly, the pavilion is not easy to set up either. Estimates show that it takes 3 people and an entire hour to assemble the pavilion. Furthermore, it takes the equal amount of labor and time for disassembly, too. Compared to other methods of charging, this represents a great inconvenience. Thirdly, a high price might prevent this technology to be implemented on a large scale. The production methods of manufacturing this intricately shaped structure are not the simplest or cheapest, and as a consequence, not everyone might be able to afford the Pure Tension. The Pure Tension pavilion is an innovative take on solar-powered charging. SDA has created a concept that is functional, aesthetically appealing and sustainable. However, it must become less space consuming, easier to use and cheaper to produce before it can go commercial. Functional, elegant, sustainable – but is it practical? The U.S. Army currently deploys drones that are used for security and surveillance purposes. Amazon, the world’s leading online retailer, has plans to commercialize the idea of the drone. Amazon CEO Jeff Bezos recently unveiled ‘Amazon Prime Air’, a service which uses unmanned aerial vehicles (UAVs) to deliver goods to customers. Drones buzzing above our heads rapidly delivering packages seems like a great idea, but one must also acknowledge certain drawbacks in design. The drone itself, called ‘Octocopter’, is not the most pretty looking. Charlie Rose, a correspondent of CBS News, described the drones as “giant, flying tarantulas”. From the image above, you can see why the drone has acquired the name ‘Octocopter’. Propelled by eight small rotors, the drone has a flying range of 10 miles. The device has parts that latch onto a yellow package box that contains the product. Despite its lack of aesthetics, the drone is ideal for its purpose: delivering goods. The drone is designed to carry objects of up to 2.3 kilograms in weight. Since this weight covers “86% of the items” that Amazon delivers, the drone is a relevant technology for the company to implement. Amazon CEO Jeff Bezos stated in an interview that the drone can deliver “within 30 minutes of them (the customers) placing the order”. 30 minute deliveries represents a great convenience for the customer. If a customer is in an emergency and needs a product as quickly as possible, drones ensure fast delivery. Combining the ability to deliver with high speed could result in significant boosts for Amazon and the country. Due to faster deliveries, the company’s efficiency and profit may increase. If other retailers implement drone delivery, the GDP of the U.S. could increase resulting in economic growth. The convenience and efficiency of the Octocopter are counteracted by equally valid trade offs. Firstly, companies do not yet have permission to operate drones in civilian areas, as stated by the FAA (Federal Aviation Administration). It is estimated that civilian air space will be accessible “to all kinds of drones in the US by 2015”. Therefore, Amazon will have to wait it out for the green signal. Secondly, there are substantial safety concerns associated with unmanned drones. According to Dr. Darren Ansell of the University of Central Lancashire, “UAVs do not currently have the awareness of their environment to be able to avoid flying into people”. Clearly, drones could collide with people while landing and injure them in the process. In cities and towns with large population densities, drones will be forced to fly at high altitudes. However, current rules do not allow this. Also, drones will be flying out in the open air and anyone can access them. By capturing or shooting down the drone, packages can be stolen or modified in transit. One must also consider that drones probably run on batteries. In the event that battery runs out while airborne, drones could drop ‘dead’ to the ground out of the sky. As silly as it sounds, it is a valid concern and Amazon must take measures to avoid this potential source of embarrassment. Thirdly, unmanned aerial vehicles flying over private homes is not an acceptable idea to some. People value their privacy and may not be comfortable with UAVs hovering above their heads. In some cases, there have been extreme reactions. In Deer Trail, Colorado, people are voting on “a $25 drone hunting license”. One individual who has acquired the license has clearly stated that he would “without hesitation, shoot down an Amazon Prime Air drone if it crossed his property”. 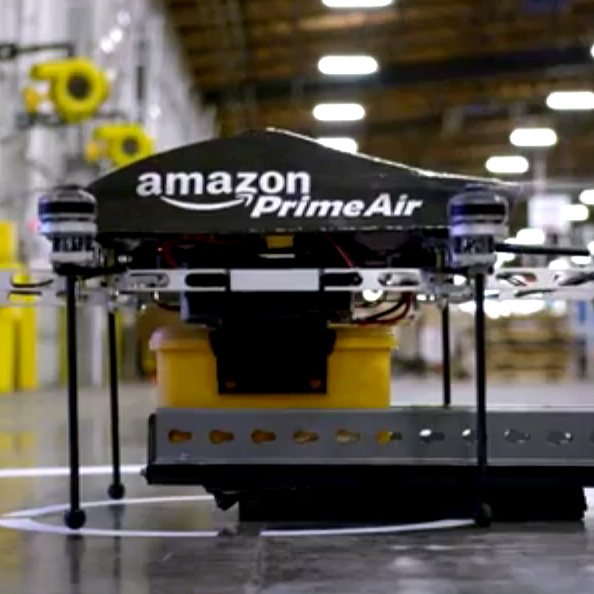 Amazon believes that in the future, “Prime Air vehicles will be as normal as seeing mail trucks on the road”. I want to take this opportunity to address the bigger picture by asking: is technological advancement always a good thing? In this context, consider how many jobs could be lost by replacing human manual labor with unmanned drones. Personally, I hope the human race achieves a balance between the inevitable march of technology and the livelihood of the average man. New York and London are separated by 3,459 miles of ocean. By air, this distance takes 8 hours to cover. In recent times, engineers have proposed the construction of a maglev train between these cities. The train zips through a trans-Atlantic tunnel at a maximum speed of 5,000 miles per hour. Most audacious of all, the distance is covered in one hour. The engineering challenge of accomplishing the project is unlike anything seen before, comparable to that of landing on the Moon. According to retired MIT professor Ernst Frankel, “from an engineering point of view there are no serious stumbling blocks”. As always, an analysis of the design features proposed will help evaluate to what extent this statement is true. The first design feature of inspection is the tunnel. Instead of building the tunnel along the seafloor, engineers have proposed another option. This involves submerging the tunnel “150 to 300 feet beneath the Atlantic’s surface”. In addition, the structure is firmly tethered to the seafloor by cables. There are a few key advantages to this choice in design. To begin, the enormous pressure at high depths is avoided and the construction process itself is made easier. It is estimated that it would take 300 years to drill across the Atlantic seafloor. Secondly, the Mid-Atlantic Ridge is situated right below the tunnel and is known for its extreme volcanic activity. By making the tunnel float, the proximity between the tunnel and the volcanoes is reduced, although not eliminated. Thirdly, the cables provide “just enough slack to allow the tunnel to absorb the impacts of savage ocean currents and tidal flows”. This additional flexibility accrues stability to the tunnel. Despite these advantages, there are serious drawbacks. Although construction is easier nearer the surface, it still poses significant obstacles. For example, only one of the 50,000 sections of the tunnel requires “enough concrete and steel to build a 10 story building”. Quantitatively, it would take 1 billion tonnes of steel to build the whole tunnel, which is what “all the world’s steel mills produce in a year”. Yet another fact to consider is that during extreme weather conditions, construction work would have to stop entirely. It is impossible to predict whether the tunnel can endure severe underwater earthquakes and currents. The second design feature of inspection is the maglev train. For a train that is thundering along at 5,000 miles per hour, friction and air resistance are huge obstacles. These are overcome by the use of maglev and a vacuum. Maglev (short for magnetic levitation) is a phenomenon where objects are propelled by magnetic pulses in lieu of wheels. Hence, the train is essentially ‘floating’ and there is no kinetic friction between the train and track. Furthermore, a vacuum is created by pumping all the air. This ensures that there is no air resistance to slow the train down, allowing it to reach high speeds. In addition, the vacuum “save[s] the tunnel from the destructive effects of a sonic boom”, a phenomenon that has the power to destroy the tunnel. One has to also consider the trade offs of this design. Removing all the air from the tunnel would take “100 jet engines, working 24 hours per day for two weeks”. This raises big questions related to the sustainability of the project. Another concern is safety. Any derailing of the train would cause the death of hundreds. At such high speeds, it is difficult to guarantee the complete safety of passengers. No doubt, a maglev train connecting two continents would have a positive impact on the lives of many. It would mobilize businessmen, goods and services, increasing economic activity and globalization. On a human level, a student studying in the States could go back home for Thanksgiving in the matter of hours. As good as it sounds, is it worth spending $12 trillion (nearly 15% of the world’s GDP) on a tunnel that takes 100 years to build? There is no easy way to answer this question, but I do believe that mankind is destined to accomplish this feat in the future. Trans-Atlantic maglev train: only a matter of time? Designing advanced exoskeletons for super-human strength seems like something Tony Stark (Iron Man) would do in his free time. However, exoskeletons find applications in the life of the common man too. A team of four undergraduate students at the University of Pennsylvania have designed ‘Titan Arm’, an upper-body exoskeleton that is controlled by the user through a joystick. 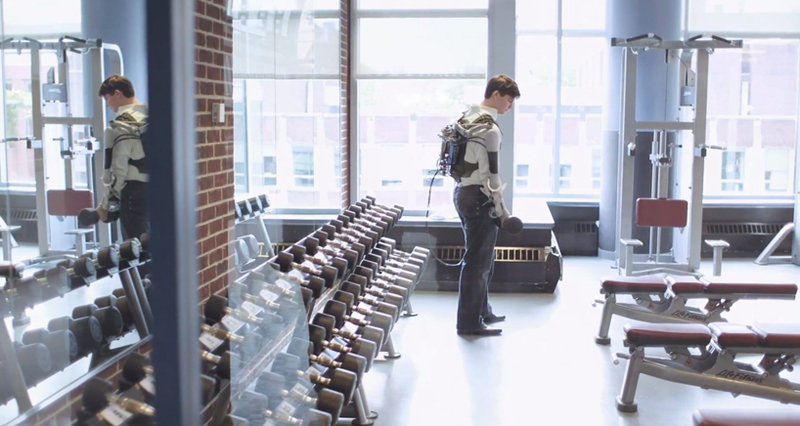 The exoskeleton boosts lifting power by 40 pounds and is extremely cheap to make. So meritorious is the team’s design that it won this year’s James Dyson Award and $45,000 in prize money. But what is the reason behind their success? Market research and key choices in design have enabled the team to achieve their objectives with this project. While researching other exoskeleton projects, the team found that a lot of work had been done on lower-body exoskeletons. To diversify, they decided to create something that would benefit the upper-body and chose to target the arms. The team’s preliminary research shows that it is important to first understand what projects have already been explored and where new breakthroughs can be achieved. 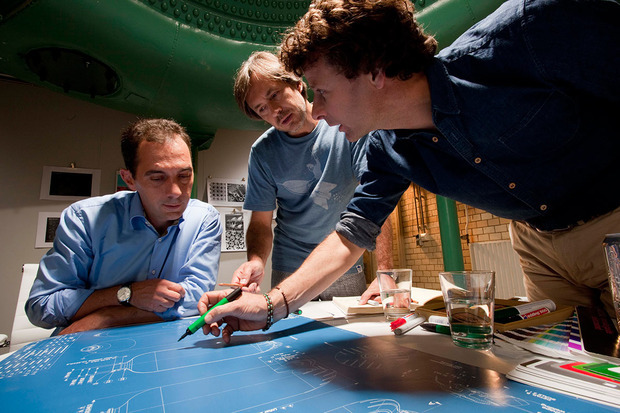 This fact, no doubt, helped the team differentiate the Titan Arm from existing projects. Furthermore, research can be helpful because it can be a source of ideas. When the team discovered that other exoskeletons were powered by pressurized gas cylinders, they had an idea. Why not use batteries instead of heavy cylinders (which are heavy to carry around) to improve mobility? In the Titan Arm’s design, we see that a lithium polymer battery supplies power to the exoskeleton. A simple choice in design like this opens up a wide range of applications. For example, a postman can use Titan Arm to lift heavy packages. Furthermore, patients can make use of the exoskeleton to facilitate recovery from injury. The team is particularly enthusiastic about exploring electromyography, where “you apply patches to the user’s skin and read the activity of the muscle, then you can pass that on to tell the arm what to do”. In essence, this gets rid of the joystick and lets muscles dictate the direction of movement. The team’s most noteworthy achievement is that they made the prototype with an incredibly low student budget: just $2,000. Other exoskeletons, such as that of Raytheon, “cost upwards of $100,000”. To put this into perspective, the team has created an exoskeleton with 1/50th the usual cost! The secret lies in another key choice in design: the use of 3D printing and CNC (computer numerical control) machining. 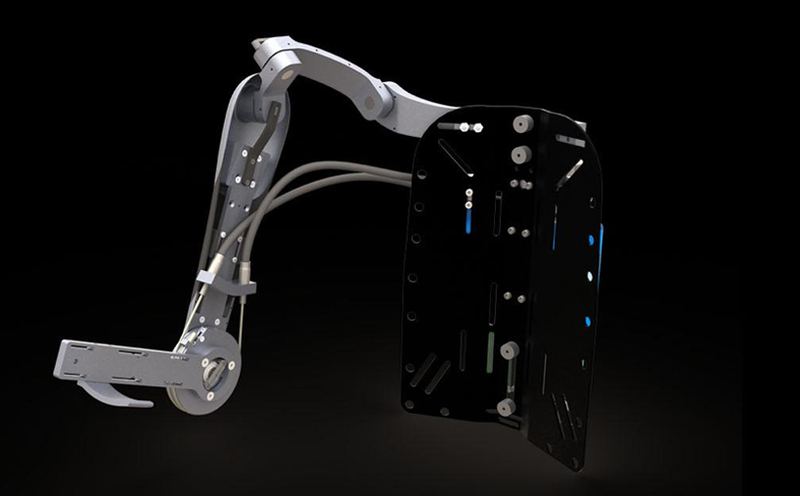 In the first step, a digital rendition of the Titan Arm was created using CAD software. In the subsequent step, the CAD data is fed into a 3D printer or CNC machine which produces the parts to exact specifications with low cost. Clearly, computer-aided design helped the team stay within their $2,000 budget. Despite its triumphs, the Titan Arm suffers from a few trade offs. Firstly, is it safe to make the product accessible to everyone? Due to its low cost of production, the Titan Arm is affordable to many. People might use the strength-boosting feature to harm others physically. Secondly, the exoskeleton makes only the upper body stronger and leads to bicep growth. The rest of the body might experience an increase in strain in trying to support the stronger upper body. Thirdly, any mistakes while controlling the joystick could lead to serious damage. Unbalanced forces on a certain joint can lead to broken bones or ligament tears. On a personal level, I find the Titan Arm project inspiring. The team consisted entirely of undergraduates and if they can do it, why can’t I? I want to make a positive impact on the world and this example has shown me how design engineering is a means to do so. Over the centuries, subtle observations have triggered revolutionary innovations. Goethe’s play Faust spurred Nikola Tesla to invent the induction motor in 1888. The shape of the ancient ‘ouroboros’ symbol led chemist August Kekulé to raise the curtain on the chemical structure of benzene. In a similar vein, MIT senior Sam Shames tapped into the potential of ‘perceived temperature’. Shames observed that while in the same room, he felt hot while his mother felt cold. Logically, this seems paradoxical because the room is at a single temperature, not two! After reading a paper on physiology, however, Shames learnt that “locally heating and cooling different parts of the body has all sorts of effects on how hot or cold we think we are”. This simple observation inspired Shames to design a piece of tech that could bring about a paradigm shift in thermal comfort. Before I introduce Shames’ prototype, a little note of context. A significant proportion of today’s energy goes into air conditioning (AC). In the US, AC “accounts for a full 16.5 percent of energy use”. Even more daunting is the fact that population growth in the future will no doubt increase the demand for cooling. How do we satisfy this future demand in a sustainable manner? Enter ‘Wristify’, an innovative device that could reduce the use of ACs around the world. Wristify is a wristband that cools (or heats) the body depending on conditions. It is based on the Peltier effect (a subset of the thermoelectric effect). Simply put, a lithium polymer battery supplies power to a copper-alloy heat sink. The heat sink dissipates heat, which in turn cools the skin. Wristify also includes an automated control system and a thermometer that work in tandem to maintain the right amount of cooling. 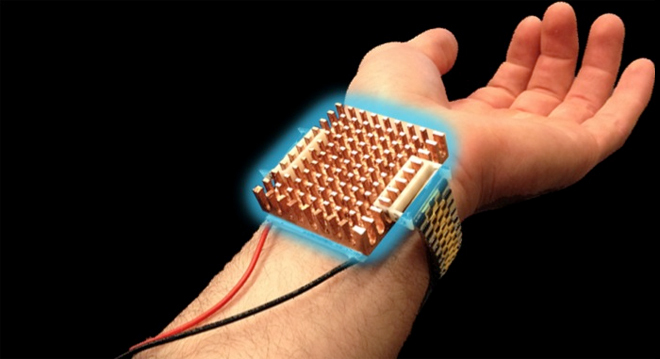 Instead of continuously cooling the body, Wristify provides “sudden jolt[s] of cold”. Shames likens this process to jumping into a cold lake. “At first, it’s bracingly cold, but after a while, you get used to it”, he explains. These jolts are given in 10-second intervals to “trick the body into feeling cold”. The positives of the Wristify are numerous. Let’s begin with the positives that are design-related. Firstly, the final version of the Wristify should not be too expensive to manufacture. Three parts are required: a Peltier heating/cooling element, a heat sink and a battery. None of these parts are costly. Also, Shames claims that effective cooling can be achieved even with half the surface area, reducing cost. Secondly, no circulating fluids are involved in cooling, unlike ACs. This eliminates the possibility of any hazardous effects caused by fluids reacting with skin. There are also sustainability-related positives of the Wristify. A substantial amount of energy is saved by cooling the individual and not the space. The team behind the prototype states that if ACs do not alter the temperature of a building by 1 degree Celsius, approximately “100 kilowatt-hours” can be saved per month. If implemented on a large scale, this technology can dramatically reduce energy consumption through ACs. Finally, the Wristify could increase the living standards of people living in hot developing countries. To gain a balanced picture of this product, it is also important to consider its drawbacks. The lithium polymer battery allows the Wristify to function for a limited lifetime of 8 hours. After this time period, batteries will need to be replaced. There is a psychological aspect that needs to be considered too. If the Wristify is in charge of regulating ‘perceived’ body temperature, what is the role of the natural cooling system of the body: perspiration? It is crucial that the design team makes sure the technology does not interfere in any way with the body’s natural processes. The Wristify is still in prototype stage. Should it go into production, it could reduce the world’s dependence on ACs for cooling. But one thing is clear to me: watches in the future will do much more than just tell the time! The beverage industry has a huge place people’s lives. Enjoying beverages, such as soft drinks or beer, with family and friends is seen as one of the best ways to relax. Due to steady demand, there is a large incentive for beverage companies to attract as many customers as possible. Product differentiation, the process of distinguishing a product from that of competitors, is one way by which companies attract customers. In 1954, legendary industrial designer Raymond Loewy redesigned the iconic Coca Cola bottle to make it more slender. Like his predecessor, Marc Newman is looking to make an impact in the beverage industry. The world-renowned Australian designer teamed up with Heineken to come up with the company’s first-ever “in-home consumer product”, the Sub. In Engineering Design lessons, Professor Devon has often mentioned the phrase “designing for need”. While reading about the Sub, this point was driven home. I find it interesting that this innovative product was a result of market research. 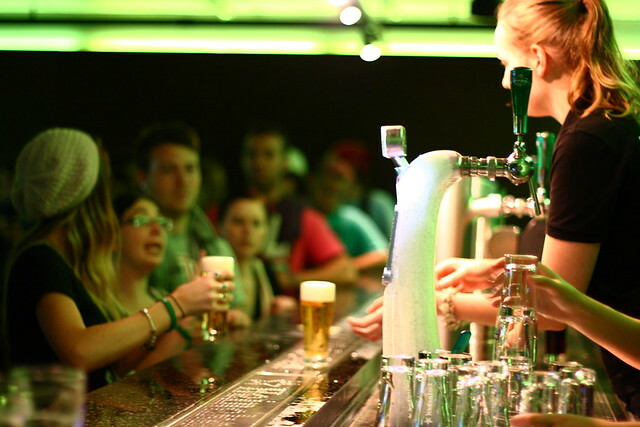 Three years ago, Heineken conducted research that identified “market need for a product that would allow consumers to enjoy an upscale drinking experience in their own homes.” A few months later, Newman was recruited to work on this project. While completing Project 1, our focus was identifying the needs of the consumer and designing our smartphone accordingly. To see this phenomenon in action on such an industrial scale shows that “designing for need” is a key strategy for achieving success. Now that we have established the origin of the Sub, it is time to talk about its function and design. A discussion of the latter will prove to be very important with regards to Heineken’s target market for the Sub. Simply put, the Sub is a home draft beer machine. It has the ability to cool beer down to 2 degrees Celsius before serving, which according to Heineken is “four degrees colder than your fridge can get it”. The cooling technology itself works on storing beer under high pressure. Sold separately are beer-containing metal cylinders called ‘Torps’, which can be loaded into the Sub before service. A Torp can hold a maximum of 2 liters of beer, equivalent to 8 glasses. The Sub’s walls are made of anodized aluminium in order to make the device more resistant to corrosion. The name of Heineken’s new product is no coincidence. The shape of the Sub resembles a submarine and the Torp is loaded into the Sub much like a torpedo. Heineken’s choice of design and nomenclature is a clear attempt to wow its target market: families looking to settle down and bring the drinking experience to the household. In an interview, Newman stated that he “had an obligation to create something beautiful and compelling to use”. At the center of the design is aesthetics and we see that the Sub has a certain panache to it. So meticulous was the design process that “even the sound it makes has been carefully studied”. 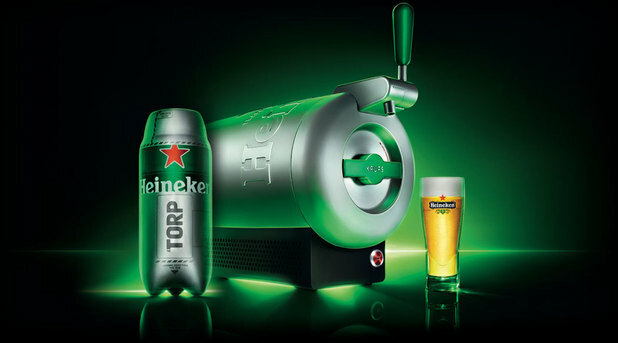 The ‘feel-good’ factor of owning this device is clearly the approach that Heineken is going with. The gold color iPhone 5S sold immensely due to its royal appearance and this shows that Heineken’s approach might be successful. While the Sub allows beer connoisseurs to have their own exotic bars, it comes with a few major trade offs. Currently, Torps come in 4 types of beer exclusive to Heineken. Furthermore, they are not available in the local store downstairs and need to be ordered online. The investment into the Sub might not be worth it for those who seek greater convenience or want to explore other varieties and brands of beer. Due to its careful design considerations, the Sub possesses visual appeal to attract its target market. However, the creation of the product finds its origins in market need. The take home message is that the initial stage of designing a product, such as identifying consumer need, is just as important as physically designing it. In the past few decades, Electric Vehicles (or EVs) have experienced a revival. With the advancement of modern technology, electric motors have become better competitors to traditional gasoline engines. Lower consumption of gasoline will lead to greater environmental sustainability, a consequence that is of great importance in today’s energy crisis. Nevertheless, certain obstacles obstruct the EV’s path to truly overtaking its gasoline-powered rival. One of the main obstacles is the inconvenience of charging the vehicle. With gasoline cars, gas stations instantaneously fill up the tank. On the other hand, electrical charging points aren’t available everywhere and are time consuming. Enter the HEVO Power Station, a product that allows wireless charging of EVs. According to COO Steven Monks, the Power Station is a “hardware device that will allow Hybrid & Battery Electric Vehicles to power up: easily, automatically, wirelessly”. Clearly, these are three very ambitious claims. Can the Power Station really walk the talk? Time for the acid test. Traditionally, EVs have to be plugged into a power outlet through wires to facilitate charging. But with the Power Station, all electrical circuitry is below the surface! As illustrated in the diagram below, power reaches the wireless source from underground. In essence, there is not a single wire sticking out of the ground. The positive implications of this are numerous. Firstly, underground wiring completely eliminates the chances of wires interfering with objects above the surface. Safety-wise, this is of great significance. Secondly, wires will not get damaged due to activity above and therefore, there will be minimal maintenance costs. Thirdly, municipal authorities tend to be very picky about wires sticking out of roads and once again, the Power Station successfully steers out of this situation. Evidently, the design feature of using underground circuitry is a masterstroke. But the firepower of HEVO’s Power Station does not stop there. Wireless charging is not entirely new to us. We see this phenomenon implemented in conventional inductive charging systems in select “smartphones, tablets, and retrofitted EVs like the Nissan Leaf”. However, the Power Station is based on resonance charging. In this system, coils are connected with capacitors that resonate at a specific frequency, which is where the name comes from. Compared to inductive charging, “the energy losses are reduced” in resonance charging and one can “transmit more energy at a faster rate”. Choices in design usually come with certain drawbacks, as so it is with the Power Station. On first thought, one would question how underground circuitry can be set up all over a city without digging into roads. HEVO gets around that too. By integrating their wireless charging source into manholes, this arduous task is avoided. However, this suffers from a lack of aesthetic appeal. The notion of combining cutting-edge technology with manholes is not the most elegant solution. Nevertheless, this point is highly subjective. What you will: manhole or charging station? Moreover, using such advanced technology leads to greater manufacturing cost. The efficiency and rapidity of resonance charging will no doubt be accompanied by higher costs. Ali Izadi-Najafabadi, an analyst for Bloomberg New Energy Finance, corroborated this view by saying: “The challenge is, it’s not that cheap”. To sum up, the Power Station is a quintessential example of the challenge of achieving sustainability. The setup of wireless charging stations across the world will encourage people to use EVs. This in turn will bring about a shift in dependence from fossil fuels to cleaner technologies. The challenge, as we see again and again, is cost. Ali Izadi-Najafabadi concluded his aforementioned opinion with: “If they focus primarily on private customers and commercial shop owners, I think it’s going to be quite a successful business model”. As it goes into testing stage, let’s hope HEVO comes up with a sustainable, yet economically viable, solution for the Power Station.